Strong winds associated with rain storms last week caused localized root lodging and “green snap”. The magnitude of this damage is influenced by several factors including crop stage of development and hybrid genetics. Root lodging occurs when strong winds pull corn roots part way out of the soil. The problem is more pronounced when soil are saturated by heavy rains accompanying winds. If root lodging occurs before grain fill, plants usually recover at least partly by "kneeing up." This response results in the characteristic gooseneck bend in the lower stalk with brace roots providing above ground support. If this stalk bending takes place before pollination, there may be little effect on yield. When lodging occurs later in the season, some yield decrease due to partial loss of root activity and reduced light interception may occur. If root lodging occurs shortly before or during pollen shed and pollination, it may interfere with effective fertilization thereby reducing kernel set. Green snap or "brittle snap" are terms used to characterize pre-tassel stalk brakeage caused by wind. Corn plants are more prone to green snap during the rapid elongation stage of growth between V8 and tasseling, especially during the two-week period prior to tasseling (variable corn development this year may have limited green snap damage from wind storms last week). Breaks in the stalk usually occur at nodes (along nodal plates) below the ear. When soil moisture and temperature conditions are favorable for growth during this stage of plant development, plants elongate rapidly but stalks are unusually brittle. Stalk brittleness is greatest in rapidly growing corn under high temperature, high soil moisture conditions. There is speculation that rapidly growing plants are more susceptible to snapping-off for several days during the few weeks before tasseling because there has been little time for plants to develop lignified tissues at the nodes. Although we encounter green snap problems periodically in Ohio, it's usually a more serious problem in the western Corn Belt. 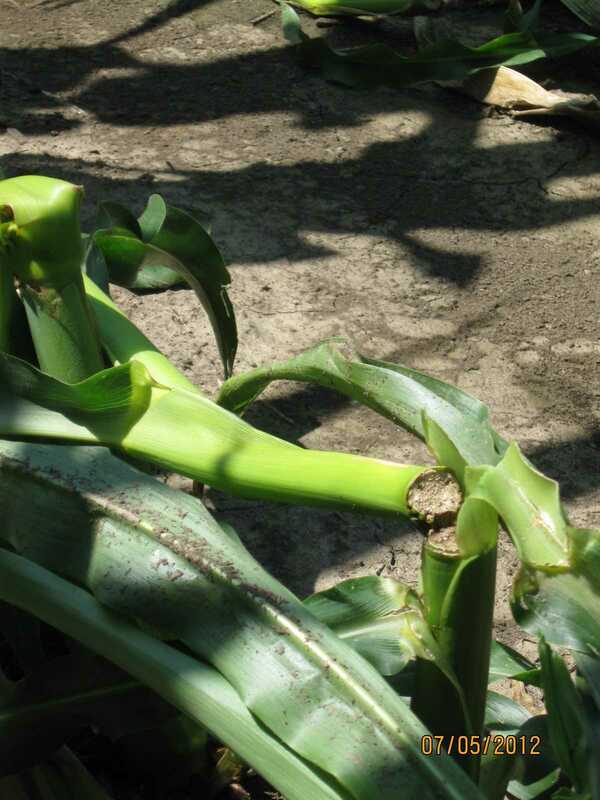 Vulnerability to green snap damage varies among hybrids. However, all hybrids are at risk from such wind injury when they are growing rapidly prior to tasseling. Once the crop tassels green snap problems generally disappear. Back in the 1990’s, Nebraska researchers observed that it was often the most productive fields with the highest yield potential that experienced the greatest green snap injury. They concluded that factors promoting rapid growth early in the growing season also predisposed corn to greater green snap injury. Fig. 1 Green snap injury near the ground will result in plants that won’t produce grain.